Tekken's Fiery Arena Brawls Described! Crazy Avatar Spills! Plus War Machine's Secret Origin! 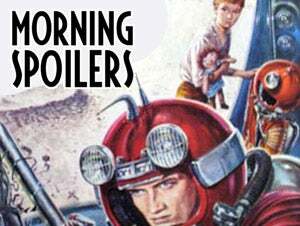 Today's spoilers include details of the first Tekken footage, plus Avatar TV spots and hints about Iron Man 2's War Machine. Plus The Prisoner, Hobbit, V, Resident Evil, 30 Days Of Night, Doctor Who, Lost, Fringe, Chuck, Smallville and Supernatural. At a party for distributors, the studio showed off some footage from this live-action movie adaptation, starring Luke Goss, Jon Foo, Cary-Hiroyuki Tagawa, Gary Daniels, Ian Anthony Dale, Kelly Overton, Cung Le, and Tamlyn Tomita. The movie follows Jin Kazama as he struggles to get revenge on Tekken Corp. chairman Heihachi Mishima for the death of his mother. And the only way to get revenge is to enter Tekken's Iron Fist Tournament. Just because. One tournament ... decides the fate of millions. ... They fight for power ... They fight for honor ... They fight for pride ... But one man ... fights for revenge. ... Courage fuels him ... Rage drives him. We see a flying car soaring over an arena in a futuristic city, and a bloodthirsty crowd waits for the action to begin. We see a montage of the movie's fighters, including Raven, Eddie Gordo, Bryan Fury, Craig Marduk, and Yoshimitsu. They all look sort of like their game counterparts. And there's lots of fighting, punching, kicking and general mayhem. Jin Kazama runs along building tops, parkour style, and fights in a cage match, rising up from the streets to the Iron Fist competition. Woo! We will be integrating Gandalf's comings and goings [into the script] because he does disappear in the book quite often. So, as opposed to the book, we see where he goes and what happens to him. The Wolf Pack come up on Access Hollywood to talk about their abs and explain why werewolves are better than vampires. Here's a brief new TV spot for this episode, premiering (in the UK) on Sunday! And here are six clips from tomorrow night's new epsiode, including Morena Baccarin turning herself into a virtual paper doll to try out outfits on. An unusual abduction in Boston reveals information about the Observer and bizarre evidence that Walter, Peter and Astrid must sort out in the lab—-in between Walter's constant cravings for a milkshake. Lois is kidnapped by Tess and forced to reveal what she learned during the weeks of her disappearance. She witnessed a future with Metropolis controlled by Zod and Clark left without his powers because of the red sun. With this information, Clark makes a big decision about Zod.